Today I am going to do a review of Xyience's Xenergy 'Premium Energy Drink'. Ironically, I am sipping on one right now as I get ready to head out to the gym. These drinks come in 2 forms: Xenergy Xtreme and regular Xenergy. I mainly use the regular Xenergy (mostly because it's what I have easiest access too). The regular come in Mango Guava CranRazz ,BLUE POM , and Cherry Lime . They used to have a Green Apple and apparently a 'clear' one. My favorite is still the original flavor of Cran Razz , although all of the flavors are actually pretty good! The newest is the Cherry Lime . I got sick of the CranRazz and started drinking the Mango Guava. Then they made the BluPom and I switched to that. I go through my phases, and usually have 3+ kicking around in my fridge for my mornings. The latest addition Xyience added are the Xenergy Xtreme - which contain more B vitamins and caffeine. These come in Orange Fuel, Citrus Slam , Cherry Rush , Lemon Blast . The Canadian ingredients are different than the original American (no Carnitine and no proprietary blends). Medicinal Ingredients per 473 mL: Taurine 2000 mg, glucuronolactone 200 mg, caffeine 180 mg, guarana (Paullina Cupana, 8% caffeine) 100 mg, panax ginseng (4% ginsenosides) 100 mg, pantothenic acid (calcium d-pantothenate) 100 mg, inositol 50 mg, niacin (niacinamide) 40 mg, Vitamin B6 (pyridoxine hydrochloride) 10 mg, Vitamin B12 (cyanocobalamin) 10 mcg. I find that the Xtreme line is LESS carbonated than the original- although the original isn't overly carbonated either (making it easy to drink in the mornings!). As for the flavor profile- they've done a pretty good job! I drink one every morning with my supplements before the gym. I love that it's not overly fizzy (carbonated). The Xtreme taste milder, not fizzy and have a Fresca type taste. 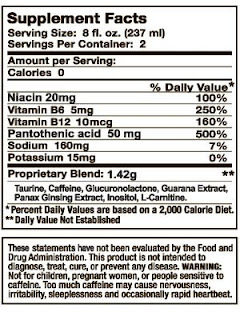 Non-Medicinal Ingredients per 473 mL: Carbonated water, citric acid, sodium citrate, natural flavors, sodium benzoate, potassium sorbate, spinach extract, sucralose, acesulfame potassium. For those of you wondering, Inositol is a nutrient that's considered a member of the B-Vitamin family. It is found in cell membrane structures and is important for metabolism of fat and cholesterol, including removal of fat from the liver. It's readily absorbed and used to produce the active inositides as necessary. The various forms of inositol (phosphatidylinositol and inositides such as IP3) are active in cell-to-cell communication, including the transmission of nerve impulses. Tissues that are affected include the brain, liver and muscles (myo-inositol). Inositol is an indirect source of glucoronic acid, which is essential to liver detoxification. Inositol is derived from rice bran. 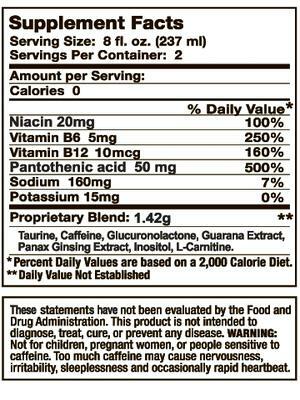 However, the amounts of all additional ingredients are very minimal in energy drinks. They don't leave you jittery, shaky, nauseous- and nor do they cause you to crash like so many other caffinated energy drinks. I'm not advocating drinking these- nor am I opposed. When we need a pick me up and are dragging, it's a nice option to have besides the standard coffee. They taste great, and aren't harmful to your health. What about you guys? What are your thoughts on energy drinks? What are your favorites? As I stated, I have no problem with them. Most of us resort to some sort of stimulant (coffee,tea, coke) to start our day and perk up mentally. These are all natural, taste pretty good, are fun to drink and definitely give me a slight edge. Good morning?? It's 8:24pm here! LOL. Anyway, I'm not a fan of energy drinks just because the only time I tried them I went a little crazy! LOL. But I do drink a lot of green tea which has a lot of caffeine.. hmm.. those do look tasty! I hear you on the crazy caffeine content, but these really don't do that! They don't make you go crazy or buzz at all! Green Tea only has about 7mg or caffeine so it's actually pretty low! I guess I should just say 'Good Day' versus morning lol! LOVE LOVE LOVE THIS ENERGY DRINK! WOOOOOOO! these are my favorite! the only energy drinks ill have.